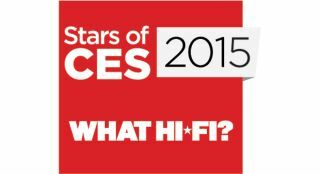 Stars of CES Awards 2015 winners revealed | What Hi-Fi? It's official – our Stars of CES 2015 have been revealed, celebrating 10 of the best new audio and video products that we've seen launched at this year's show in Las Vegas. The What Hi-Fi? team has been scouring the rooms of the Venetian Hotel at CES 2015 to uncover the hottest equipment that are set to make waves in the tech year ahead. This all-in-one home entertainment solution with a disc drive that can handle a variety of formats - Blu-ray, DVD, CD and SACD, as well as aptX Bluetooth wireless streaming and HD audio decoding. Not only that, but it packs in 250W of amplification across five channels. It's due on sale in June. Do you want flawless CD ripping? Wired or wireless DLNA compatibility? A huge amount of memory for storing your music? Or every input and output you could conceivably think of? Introducing the AK500N, the first desktop audio product from Astell & Kern that's due on sale in "early 2015". ATC struck upon success with its five-star SCM40s and the indications are that the active version of the speakers is going to prove equally as favourable. The SCM40As feature ATC's tri-amplifier pack, which makes them worth of an Award alone. The SCM40As are due on sale imminently. "Liquid Wood" is a new one to us, but nonetheless is a thing. Not least because AudioQuest has made liberal use of it when constructing the earcups of the Nighthawk headphones. 3D-printing technology and a semi-open configuration are also prominent features. The BeoSound Moment music system is another demonstration of Bang & Olufsen doing things differently when it comes to audio products. It's as stylish as you'd expect from B&O kit, but its ability to learn what you like to hear - and when you like to hear it - makes it an intriguing prospect. It's due on sale on 30th January. CES 2015: Bang & Olufsen introduces BeoSound Moment music system with "mood control"
Chord's Hugo DAC/headphone amp picked up a What Hi-Fi? Award in late 2014, but its Qute DAC wasn't upstaged either. Now the manufacturer has taken its Hugo's DAC technology and packed it into the Qute's delightful casing to make the Qute 2. It promises to be quite the star. Is this HG Wells' hi-fi in the flesh? Dan D'Agostino's MLife amplifier integrates built-in Bluetooth, AirPlay and DLNA into the company's Momentum amplifier, while adding an LCD display too. It also comes with 24-bit/192kHz support as well, making it seemingly deserving of that hefty price tag. It's due on sale in March. Not strictly a product, but still very much deserving of an Award nonetheless. Meridian Audio's MQA is a new way of packaging high-resolution audio in a way that's so innovative that it takes up no more bandwidth or broadband data capacity than a CD-quality FLAC file. The biggest advance in audio quality for decades? Quite possibly.